AMERICA'S MOST TRUSTED DOCTOR TEAM CRACKS THE CODE ON WAIST MANAGEMENT For the first time in our history, scientists are uncovering astounding medical evidence about dieting. Now Michael Roizen and Mehmet Oz translate this cutting-edge information to help you shave inches off your waist, by giving you the best weapon against fat: Knowledge. Through their signature entertaining style, Drs Roizen and Oz teach you about your body -- how and why it stores calories, burns fat, and reacts to the foods you test your body with. Ultimately, they give you the Plan and formulas that will help you lose up to two inches from your waist in two weeks on your way to your ideal size. 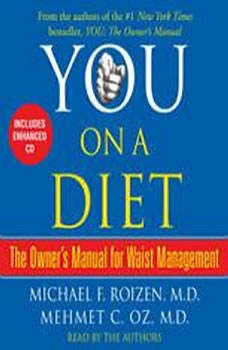 By following the YOU diet and YOU activity plan, you will... Challenge your beliefs about diets Learn to rule the elegant systems controlling your body fat Never feel hungry Never yo-yo again Feel better, look better, and live healthier Equal parts information, motivation, and change-your-life action, YOU: On a Diet will revolutionize the way you think about yourself and the food you consume, so that you'll diet smart, not hard. Welcome to your body on a diet.